An Ode to the Humble Safari Jacket | A Continuous Lean. Every time a technology company announces their latest, greatest, simply â€œmust haveâ€ gadget, we tend to find ourselves asking the same question – where? And that’s not â€œwearâ€ as in the Apple Watch’s wearable tech, it’s â€œwhere,â€ as in â€œwhere the hell are we going to put this?â€ As men, we suffer from a storage deficiency. Sure, a spacious bag can be a man’s best friend, but there’s a reason Superman’s Batman’s cape was for show while his utility belt did all the real work – it’s just easier to have your gadgets at hand. This problem is never more pertinent during summer when most men are left with nothing more than two measly pant pockets, and so we thankful that jacket season has returned once again. A jacket, if designed properly, can turn you into a walking filing cabinet (without looking like one of course), and few jackets are designed quite as well as the Safari. This modified sport coat emerged when the Sahara first came in vogue during the twentieth century, as members of upper class westerners flocked to the â€œmysteriousâ€ continent of Africa. The Safari Jacket allowed these deep-pocketed Anglos, who were swept up in the allure of an â€œunexploredâ€ land, to wander the countryside without the burden of luggage. Within the Safari jacket’s four front pockets, they stashed their binoculars, their notepads, their guns, their ammo, their guidebooks, their souvenirs, and any other adventuring accoutrement that they had stocked up for these excursions. Today, the purpose is the same, but the inventory is just a touch different. Nonetheless, whether you’re Teddy Roosevelt lugging shotgun shells in the twenties, Yves Saint Laurent toting a flask in the sixties, or just a guy with more iPhones than ears, the Safari Jacket is the ultimate in â€œwhere-ableâ€ technology. These vibes, minus the Elephant hunting. 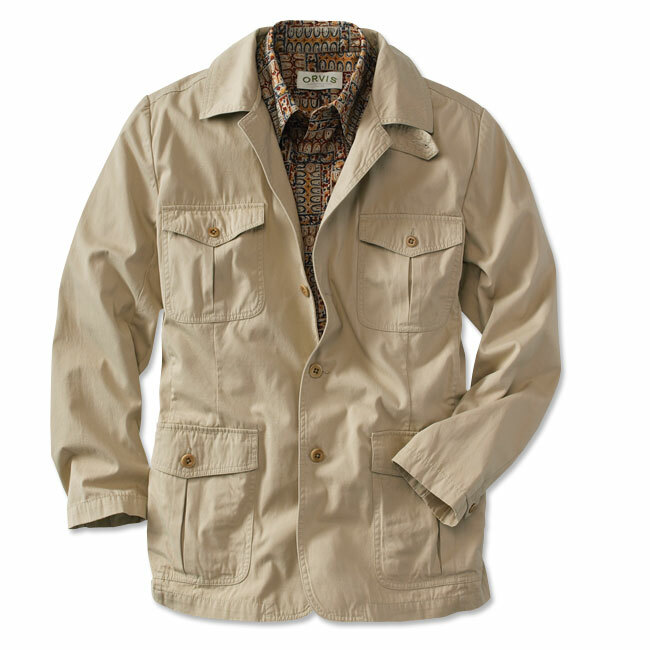 A modern Orvis travel / safari jacket. Ya I remember this old jacket in old movies. Sad that I feel compelled to point this out but I just can’t fight my inner nerd. Superman didn’t have a utility belt. Batman did. I think you mean Batman, not Superman. Is that catalog screenshot from an old Banana Republic? It just reminded me that I still have all of the copies of their very J. Peterman-esque catalogue from the 80s. I collected them back then as a teenager, I have no idea why. Great post on such a classic piece. The function-driven pieces always bridge across the decades. Any idea who is in the photo beneath Clark Gable? I still own two of the early runs of the Willis and Geiger Selous jacket (see Hemingway above). The Afrika Korps did a pretty sporty high waisted tropical uniform that was very much a safari jacket less the built in belt. Ralph Lauren made his own version, but his looks a lot like the one that Rommel was familiar with. A very neat style, no doubt about it. Brings to mind Bert Pulitzer. Unfortunately, they have closed, but easily the best safari jacket I have owned was driven by someone who outfit themselves exclusively at F.M. Allen for their frequent Africa trips. Granted it was in one of the stiffest locales in NYC (UES), but the staff was really low-key and actually lacked the pretension that I thought kept me from checking it out in the first place. If you can track a safari jacket down by FM Allen, buy it! They’re a great weight, can be worn in fall/spring weather just as easily, and are water repellant (sales associate poured a cup of water on the sleeve to demonstrate). Too bad they never got a profile on ACL. @Justin I would visit that shop frequently when I was on the UES. Too bad they went out of business. Don’t think an ACL profile would have prevented it. Love the belted safari style but it does add a lot of girth to the midsection. I think you either have to be quite thin or else 6 ft. tall, grizzled and appropriately weighty a la Hemingway to make it work. Definitely dusting mine off after reading this in any case. We can’t all be Clark Gable, but with the promise of Ava Gardner and Grace Kelly hanging off each arm, we sure do want to try. That is indeed a vintage Banana Republic catalog. I bought big from them in the late 1970s, 1980s (when they only had the Mill Valley store, and a little boutique on upper Polk St near the Alhambra Theater in San Francisco), and loved the Zeiglers’ prose and drawings in a day when photos and gloss were the norm. When Herbert Gold and others started contributing “clothing reviews” or odes, the nature of their “found surplus” and house brand clothing became near legendary. I lost all my saved catalogs, and wish I hadn’t discarded them. Some of their original designs (e.g. a Grenfell cloth windbreaker, rather like a Baracuta G10) were brilliant. I still have their reproduction of an Italian WWII paratroopers shirt, so that I can have a bespoke maker reproduce it for me someday. Most of my other BR Egyptian Cotton clothing became so soiled and worn to be unusuable. But I still have many items from their massive warehouse sale when The Gap bought them. That warehouse represented years of clothing safaris and unusual finds that were waiting to be sold through the stores. T’is a pity, I don’t know of a firm today that finds vintage clothing and then reproduces it with an eye to detail, quality, and style. Most of my BR clothing lasted me through a career in the USCG, traveling to the Caribbean and exotic Gulf Coast South (Florida, Alabama, Louisiana). 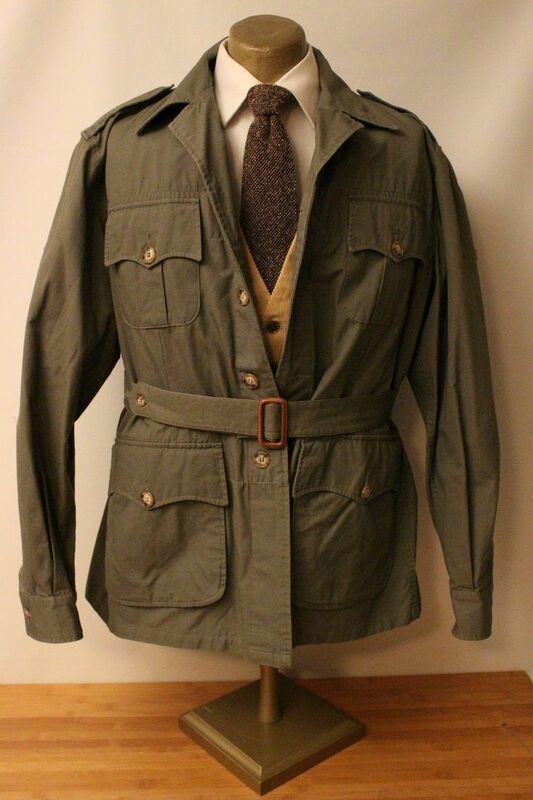 Another bygone firm, Willis & Geiger, designed a safari jacket for Hemingway with an integrated shooting pad in the right shoulder, and slots for shells above the left breast pocket. Some people still make something based on this variant. I never kept those huge, glossy W&G catalogs, either; dumb shortsightedness on my part. They had some fascinating stories and articles. Of course, no mention of vintage safari gear is complete without referring to the old Abercrombie & Fitch firm. I believe Eddie Bauer worked there before striking on his own, but did some work for W&G under a WWII contract for the timeless US Navy G-1 (model SSJ14-AER). Still called “the Bauer model” by those who know. … I still remember playing on the Omersa leather rhino as little boy in Abercrombie’s San Francisco store on Union Square. The previous comment is correct, the vintage safari clothing has among its origins the clothing designed for Her Majesty’s troops in India and other tropical climes. The hot climes necessitated use of fabrics, colors, and designs that deviated from tradition, inspiring a new tradition. In fact, I recall the traditional color and the name of that color come from those days of the British Empire in India: khaki. I was in the Air Force from 1958-62 and at that time the safari jacket was the standard issue jacket of the summer (505) uniform. I thought it looked silly and rarely wore it because it usually was too hot in Texas in the summer to wear a jacket. But when I went home on leave I donned that safari jacket because if I traveled in full dress uniform the airlines would offer a reduced fare. I miss the Peterman catalog and wish it would come back. Sorry I didn’t save them. But I still have my Hemingway deep sea fishing cap (the one with the exaggerated leather bill) and whenever I wear it around I always get comments.